CAR T cells are currently one of the most promising new approaches in cancer therapy (Jackson et al., 2016). In late summer of 2017, CAR T cell therapy saw a historic success as a CAR therapy by Novartis was the first gene therapy ever approved by the U.S. Food and Drug Administration (FDA) (Clinical Study CCTL019B2202). In October, a second CAR therapy against certain types of large B cell lymphoma was also approved by the FDA (Neelapu et al., 2017). Even in the light of this huge step forward, CAR T cell therapy is still challenged by safety aspects such as severe or even fatal off-target effects (Morgan et al., 2010). These side effects are especially difficult to overcome in the therapy of solid tumors. In our project, we thought of introducing a novel safety mechanism in form of an AND gate controlled expression system with great potential for further improvement of cellular cancer immunotherapy. As a further safety feature, we tested a suicide gene based on the herpes simplex virus I thymidine kinase (TK). This feature can be used to induce apoptosis in TK expressing cells via treatment with ganciclovir, a common compound already used to treat herpes infections (Fillat et al., 2003). Implementation of these mechanisms allows the usage of our T cells to fight solid tumors. The treatment of breast cancer with ERBB2 specific CAR T cells could become feasible if such an additional safety mechanism could be applied. This treatment showed severe adverse effects in a clinical trial in which CAR T cells attacked respiratory epithelium (Morgan et al., 2010). Enabling the treatment of inoperable neoplastic lesions with CAR T cells is a long-term goal, as the burden of aggressive combined radio- and chemotherapy could be reduced for patients. Another favorable characteristic of T cells is their ability to form memory cells after an infection has been cleared (Mahnke et al., 2013). In case of cellular immunotherapy this would lead to a prolonged “immunity” against the treated tumor. This property is of special interest in treating already metastasized and aggressive tumors where it reduces the risk of patients to suffer cancer recurrence. Patients, suffering from late stage malignancies could even be treated with a combination of conventional therapies along with CAR T cells, improving the chance of clearing all metastatic lesions and reducing the risk of recurrent outbreak from unaffected micro metastases. A further topic in cancer immunotherapy aims at enhancing CAR T cell efficacy by neutralizing the negative effect PD-1 has on T cell activity. Therefore, PD-1 receptor knockouts in the therapeutic cells or neutralizing antibodies directed against the ligand are currently tested. These approaches lead to enhanced killing of target cells (Cherkassky et al., 2016). In this more aggressive set up of a CAR T cell therapy, an additional safety mechanism like our AND gate controlled CAR expression would be highly recommended. The CARTELTM AND gate model could be used in the future to optimize CAR T cell therapies. Until now, creating CAR T cells is a comparably expensive and work intensive procedure. This is due to the workflow by which they are generated, including the isolation of T cells from the patient, the need of cultivating, transducing and expanding them in culture, as well as designing a CAR targeted against the specific type of malignancy. So called “off-the-shelf T cells” could be applied to reduce costs and time consumed by CAR T cell therapy. This therapy is based on allogeneic donor T cells which are negatively selected for reactivity against host antigens, allowing to skip the isolation and cultivation of host T cells (Yang et al., 2015). In a similar approach, allogeneic donor T cells could be used to produce a T cell line pre-equipped with our CARTELTM AND gate. In this cell line the endogenous T cell receptor could be knocked out to prevent graft-versus-host diseases. The off-hand side of such an off-the-shelf approach is that an immortalized cell line can itself be the origin malignant tumors. If the MHC loci of the allogeneic cell line are not matched to the host, the efficacy of the transplanted cells are also of doubt, due to host-versus-graft effects. A more promising optimization of cancer immunotherapy could be achieved by applying the Sleeping Beauty system to transduce host derived T cells with the desired CAR alongside our AND gate constructs, providing improved safety (Singh et al., 2014). An additional optimization would be the establishment of a CAR library containing a variety of predesigned CARs directed against the most prevalent forms of cancer. Using efficiently transduced CAR T cells alongside our CARTELTM AND gate system would greatly improve cancer therapy by increasing the safety of cellular cancer immunotherapy while lowering the financial and temporal load. The AND gate system itself could be modified by incorporating additional features of tumor microenvironments. By adding a third input parameter to the AND gate, activation of therapeutic cells could be even tighter restricted to cancerous tissues. The combination of individual inputs could also be altered depending on the type of solid tumor that is to be treated and its specific microenvironment (Hanahan & Coussens, 2012). AND gate systems are not restricted to inputs from the tumor microenvironment, but could also be used in other cell based therapies. In therapies based on the immunomodulatory effect of regulatory T cells (Tregs) against chronic inflammatory diseases an AND gate could be used to direct Treg activity towards specific sites of inflammation (Singer et al., 2014). This could be used to specifically treat autoimmune diseases or protect organ transplants while avoiding systemic effects like decreased immunocompetence. Engraftment of hematopoietic stem cells could be enhanced by Tregs that, controlled by an AND gate system, home specifically to the bone marrow. 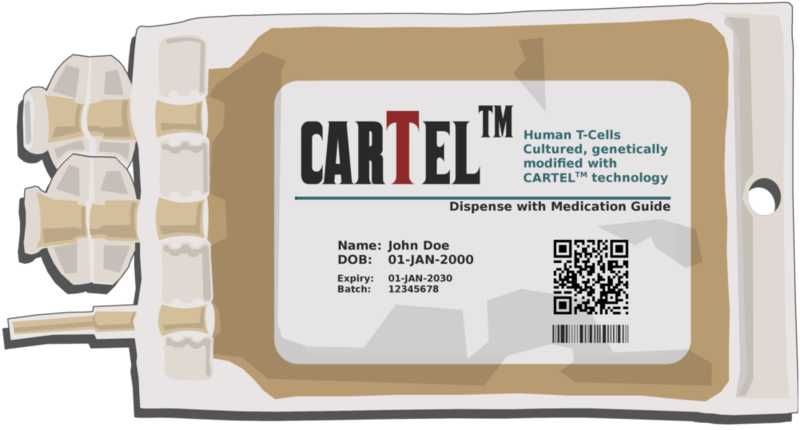 All these applications and possible modifications indicate AND gate based systems like CARTELTM to be a highly versatile and valuable tool for cellular therapies.